What’s the Difference Between Pex and Copper Pipes? There are two main types of piping used for both residential and commercial plumbing. These types of piping are identified as pex and copper. This isn’t to say there aren’t other types of piping out there but any new piping project will use one of these two types of piping. Both pex and copper have a very different appearance and offer a number of unique advantages. Odds are you won’t be faced with having to choose between these piping options until you need to repipe a section of your home, or if you’re really unlucky your whole house or business. In this article we will explain the details of each type of piping along with their advantages and disadvantages. It is easy to identify pex piping in relation to copper piping. Pex piping is usually white or clear in color, occasionally you will see colored lines, red pipes are used to identify hot water lines and blue pipes are used to identify cold water lines. Pex pipes are also flexible and are made of a high density cross linked polyethylene so they look plastic. 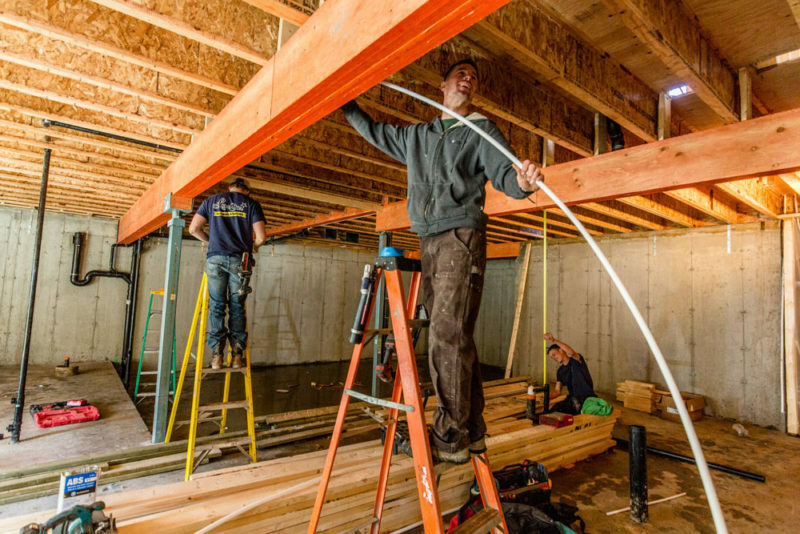 Pex pipes are also secured differently than copper pipes as they are usually attached to floor joists or wall studs. The main advantage of pex piping is that it is durable and very cost effective. The material for a pex plumbing project is very budget friendly and since it is easy to install the cost for a plumber to install it is cost effective as well. Identifying copper piping is very easy since they are well, made of copper. Copper pipes are metal, rigid and have copper fittings. Copper pipes have been around a lot longer than pex piping and have more than proved they are a long lasting piping solution. The main downside of copper piping is that it is not nearly cost effective as pex piping. Copper piping materials cost a lot more than pex and copper piping is much more difficult to install. This means you will need a more experienced plumber and more time to complete a copper piping project. However its longevity and longer warranty can be well worth the extra cost. Which Piping is Right for my Project? Well that will really depend on what your project is. The best way to know what type of piping will work best for you is to speak with one of our licensed, expert plumbers. They have the experience and knowledge to help with any project and identify the proper materials needed. If you have questions about an upcoming plumbing project please give us a call.